Clown Fish Inflatable Pool Toy Just $15.44! Down From $38! You are here: Home / Great Deals / Clown Fish Inflatable Pool Toy Just $15.44! Down From $38! 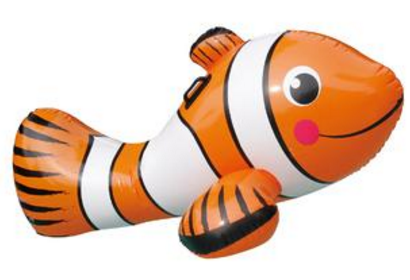 Sears has this Clown Fish Inflatable Pool Toy on sale for just $15.44 (Reg. $38)! Kids will love to hitch a ride on everyone’s tropical favorite, the clown fish! This big, colorful Clown Fish Inflatable Ride-on Pool Toy measures a full 67-inches and features two grab handles. The heavy duty vinyl is built to last. The Clown Fish Ride-On will make a big splash at your family gatherings.